"I was absolutely knocked out to receive your box of Walkerloo soldiers: thank you so much. I can't tell you how delighted I was to receive it... It's difficult for me to pick out features that impress particularly, as I can't find a single thing to criticize about them... I hope that potential buyers appreciate the accuracy of the figures: I've noticed little touches that some might not, e.g. the gunner holding his ears to protect against concussion of the gun firing - he has his mouth open, which is of course exactly right.... I think these figures are just wonderful." Philip Haythornthwaite Author and Military Historian. "At my age, it takes something quite special to excite me, but when I picked up your package from my doorstep yesterday and unwrapped it, I was excited by what you have accomplished. It is truly a noteworthy accomplishment... ...the great variety in the faces and postures of all the figures sets them apart from the usual sheet of paper soldiers...." Edward Ryan(1919-2009) Author of 'Paper Soldiers' and... .
John Tunstill Toy Soldier Expert. The order arrived safely - thank you. The figures really are lovely. Your art work is just beautiful capturing the uniforms but, importantly imparting character, and a touch of humour, into the figures... a lovely product. Thank you again David W.
Compliment for wonderful toy soldiers!!!!!!! When British line infantry, prussians and french Guard? 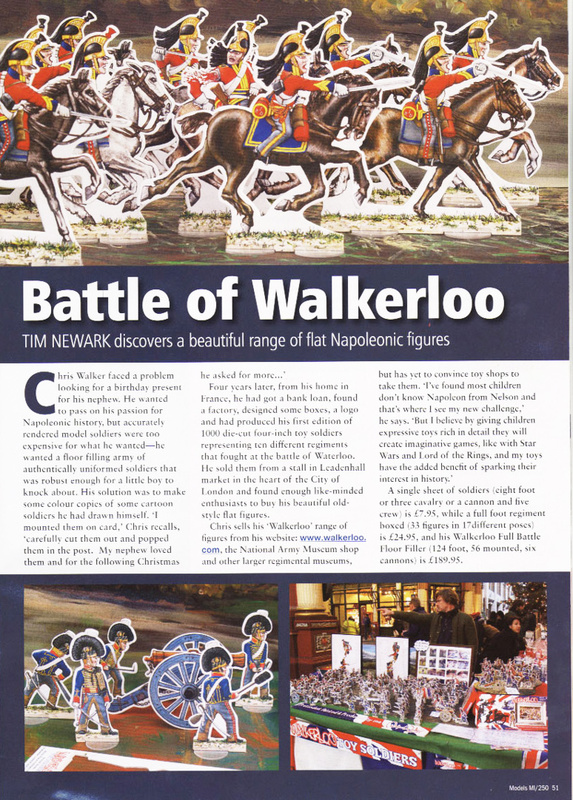 Hi, I read about your soldiers in Toy Soldier magazine and then saw them in the Napoleon's Last HQ Museum at Waterloo,this weekend, where I bought some Cuirassiers. I normally only collect metal soldiers from the Napoleonic period but yours are absolutely charming! I am in the Royal Scots Dragoon Guards the antecedent regiment of the Greys... congratulations on a great product and please let me know when the Greys will charge! Thanks to everyone who's commented and sent in pictures!